Gabriella Laberge may be from Quebec, but her heart set its home in France a long time ago. After releasing her debut album, The Story Of Oak & Leafless in 2015, the singer-songwriter and composer auditioned for the French edition of The Voice in 2016, making it to the Top 12. 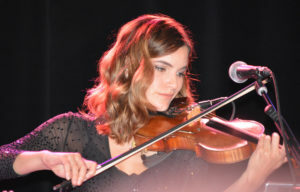 Her beautiful violin rendition of Coldplay’s «Fix You» swooned the country over, and it seems like the love was mutual. Gabriella then spent the following year going back and forth between Canada and France to perform for her fans. After kicking off 2018 signing with Universal Music Group’s label Polydor, Gabriella spent the year working on her new sound and her new album. Now a few days away from performing her new song «On Cherche Encore (Never Get Enough)» on Destination Eurovision, we caught up with Gabriella to know all about her 2019 plans. Stage Right Secrets | You competed in The Voice France, and you’re now rehearsing for Destination Eurovision, another French show, in order to represent the country during the European singing contest. You’ve come a long way from your native Quebec, yet you seem to have left your heart in France. Why do you think this is? Gabriella | I’ve experienced so many beautiful things in France (I traveled there 32 times already) that every time I go back now, I feel at home. I’ve made friends and even got my own place in Paris. My label, Polydor, is also located in Paris, so that’s convenient. There’s always this peculiar feeling of being a foreigner. Everything amazes me, and I am very into trying new things. I’ve also discovered a huge amount of French-speaking artists, who are now part of my musical baggage (Tibz, Christine & The Queens, Angele, etc). Your debut album The Story of Oak & Leafless, released in 2015, is a little gem made of soft pop-folk melodies over which your voice mingles with guitar and violin chords. Your single for the Eurovision contest “On Cherche Encore (Never Get Enough)” and the few new songs that your fans were able to hear exclusively during your latest shows have a very distinct sound, far away from what you’ve done in the past. What would you say influenced this change in music style? It was a radical change indeed! I wanted my first album to have a folk/classical vibe. I was still trying to find out who I was at the time, and it shows in the topics of my songs. Since I had just graduated from a music school, and since all my friends were musicians, I really wanted all the instruments on the record to be acoustic and the sounds to feel raw. With all my back and forths between Quebec and France, I discovered a lot of different music styles that made me want to push myself out of my comfort zone. My introvert side is still present on this new upcoming album, but I put the emphasis a little bit more on my eccentric side because I am so full of energy and I wanted to show that on stage. However, since I have been playing the violin for 18 years (already! ), the two albums have one thing in common: they are jammed with chords, especially violin and cello ones. But in my upcoming album, I use these instruments in a very modern way. 2018 started with a bang with you getting a record deal, and was then rhythmed by all these back and forths you mentioned between Montreal and Paris. What can we expect from you in 2019? We can expect more back and forths, to Israel this time, for the Eurovision Singing Contest! (Joking) Apart from that, I am currently preparing a solo tour. I will do everything on stage: play the violin, the piano, the guitar, use a loop station and a sampling pad. I really hope I will get to be on tour as much as possible because I love it so much! My second album is coming out this spring. And you never know what might happen! And of course, the back and forths between Paris and Montreal will continue, because my goal is to stay inspired and to be able to sing my songs around the world.